And it’s Westward Ho for … Cambridge! 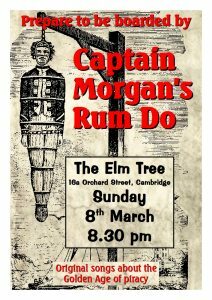 Well, it’s a bit nearer than Trinidad – and we’re back at the Elm Tree on Sunday 8th March. Please come and join us! 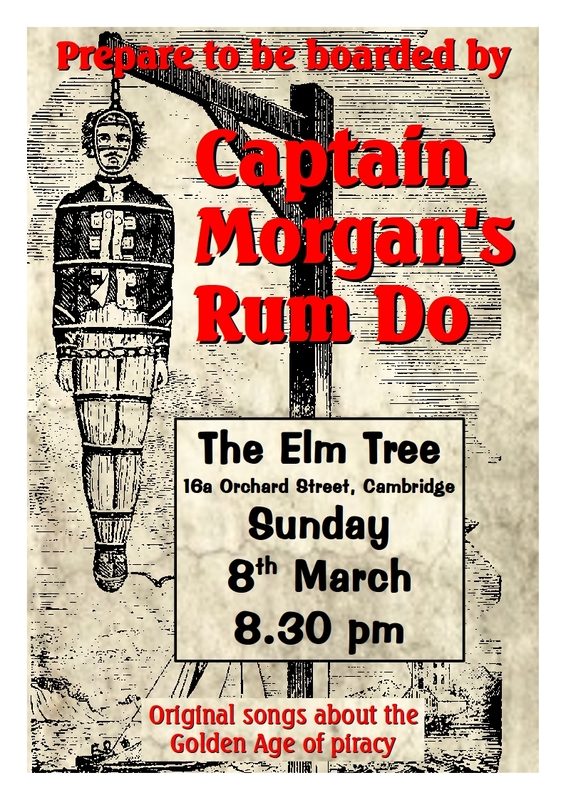 Great gig last night – thanks Rob and Jessica and everyone else at The Elm Tree for making us welcome and providing excellent beer to lubricate our throats. Some very gratifying comments from the audience. And where would we be without an audience! In a flurry of activity yesterday evening, the showreel and the website were released into the wild. After splashing about a bit in the shallows by a warm Caribbean beach, they thought they ought to welcome you all to what we hope will become the go-to website for what The Captain has described as “Lots of scabs, wenches, puss and gore….” We already have a few dates for your diaries, which will follow in the next few days. Stick with us, it’s going to be a lot of fun … and blood … and cut-throats … and hangings. Not to mention great music! At last, with the Captain’s approval, we have a functioning website! Released into the wild today, I know it’s still a little bare, but you can have a look at us, at least! 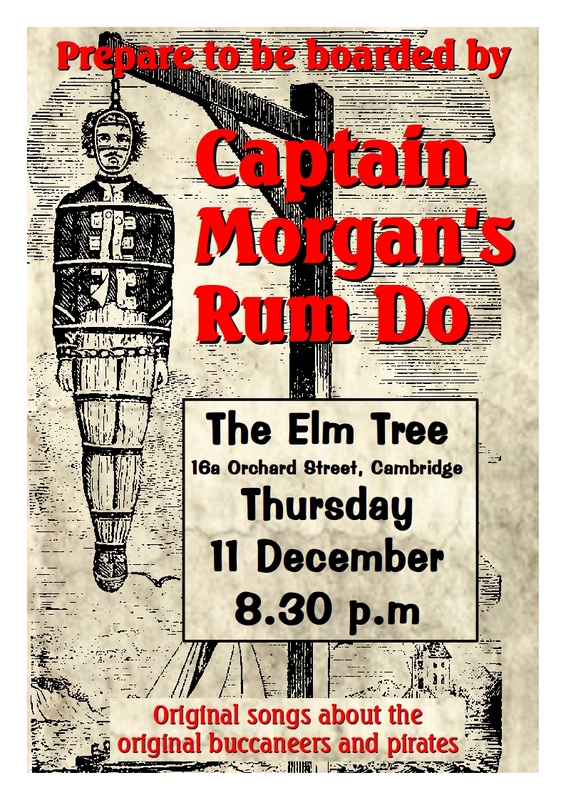 Well that’s that done (subject to the Captain’s approval) – now to get back to sorting out this ‘ere website and one or two other bits and pieces! If actors (luvvie!) can do it, so can we! I’ve now put the second draft of the showreel on the “About Us” page … I know it’s taking a while, but I’ve had a lot on my mind! Well, I’ve made a start! Tomorrow (or, really, later today) I can start putting stuff together! Calico Jack … Black Bart … Blackbeard … Israel Hands … You wouldn’t want them as house guests, but you’ll listen to their stories for hours! 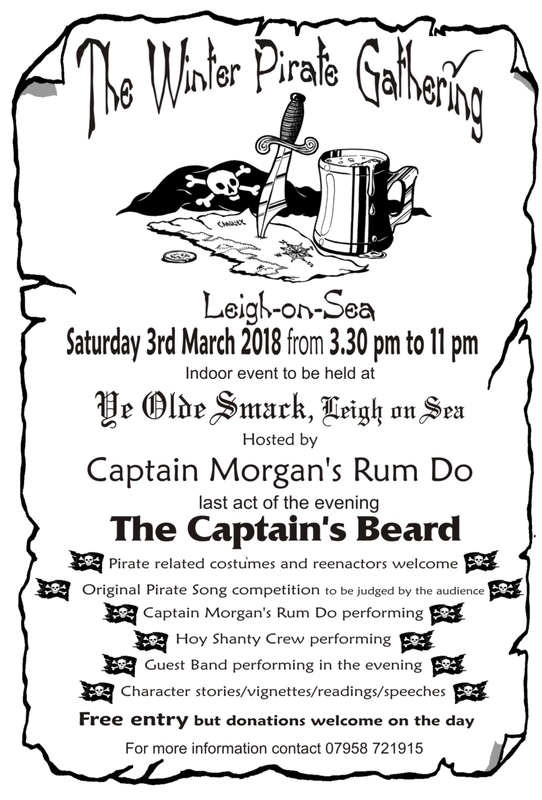 Welcome to Captain Morgan’s Rum Do – home of all things piratical, and none of your Walt Disneyfied, cleaned up fictions, either!